US 1st Infantry Division - "The Big Red One"
What dog of a place... Mediterranean is supposed to have beautiful women, clear blue sky's, and warm kind weather. We got none of the first two, and a little of the third with the cold Tunisian wind blowing upon us time to time. The fighting was good though, the men were in very good spirits, and we have the battle report to prove it! The guys have been griping at me that the website needs to change, for the better. I haven't heard any particular gripes, though I'm pretty sure that it has something to do with the fact that website looks like it came out of 1995. Rest assured people, I will work one something better, beefier, although I have to warn all of you that it might take a while... And that I will start working on it after university is done, in 2 weeks or so. Summer side project, so to say. "After much fighting across Morocco, we have finally entered Tunisia. We knew very little of the area, and proceeded with caution as we headed across. We encountered a very large contingent of the 2nd SS, with multiple vehicles against, one scout car included, against our 3/4 ton. We gave them hell, took out the car, and chased 'em off. Later command advised 1st squad to find the camp that the Germans came out of. Turned out to be empty, with only the cook being present! We drank the hooch, screwed the pooch, burned down the camp, and threw out a couple of mines just to irritate the Germans. In the afternoon 1st squad went on a long hunt for German's, finding nothing to the least bit. From what we heard, 1st squad was taken by surprise, not before the BAR gunner took down a couple of German's to even out the count. By late the 2nd squad found it's way around and ambushed the German's, with the day ending with the 37mm peppering the hillside and taking most of the German's out that were left... It was a hard day, we lost many good men, and the German's paid for it 5 fold!" For all who are wondering why the site looks so plain, to put it simply, I dogged it up and now it's FUBAR. Looks like that new webpage is coming sooner than later! We will also definitely face the Germans out in the high deserts of Oregon. Who are we you might ask? 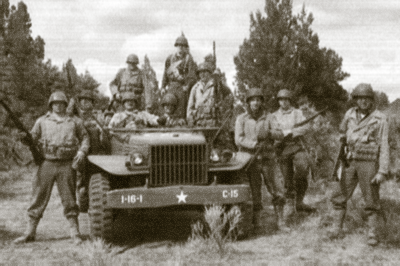 We are a World War II reenacting group, part of the Northwest Historical Association (NWHA). We reenact the American soldiers of C Company, 1/16th Infantry Regiment, 1st Infantry Division. Please visit the About Us page for a better description of the unit. Note: Since March 2007 we received 2000+ hits which of 900 are unique users. Since 02/04/2008 we've had 7000+ hits, a good lot of them unique!